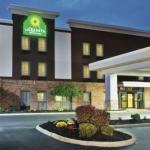 Free internet access and breakfast help put La Quinta Inn Grove City on our guests' list of top area hotels. The non-smoking La Quinta Inn Grove City has three floors and all 84 rooms offer free high-speed internet access as well as rooms with cable TV free local calling and comfortable beds. The free expanded continental breakfast will get your motor started and the hotel's 24-hour front desk can help you with any business needs while you're on the road. The indoor heated pool and the fitness room are just the places to de-stress after a day of driving working or touring the area. There's even an on-site laundry facility which can come in mighty handy when you're on the road. Pets are welcome with some restrictions and parking is free. La Quinta Inn is convenient to I-71 and I-270 15 minutes from downtown Columbus and 16 miles from Port Columbus International Airport. The Ohio State University campus is a 20-minute drive from the hotel. Several casual restaurants and two golf courses are within two miles of the hotel. Dogs of all sizes are allowed. There is a $25 refundable pet deposit if paying by cash. There is a pet policy to sign at check in. Dogs may not be left unattended, and they must be leashed and cleaned up after. They are not allowed in the food or pool areas.